This day is actually nothing like I first thought when I heard the name. I was picturing moms that are just so great you want to give them a star sticker, like the kids that get a sticker for being good at the doctor’s office. I suppose these moms do deserve a star like that, but the holiday is about something else entirely. During World War I, U.S. families with men in any of the armed forces began to display “service flags,” a custom that is still used today in some areas. A service flag is white in the middle with a large red border around it. Each family member in the forces is represented by a blue star. However, if one of them dies during service, their blue star is changed to gold. The Gold Star Mothers organization was begun by a woman named Grace Darling Seibold. When her son, George Vaughn Seibold went overseas, Grace joined many other mothers, sisters, and wives in the important work of caring for and encouraging injured servicemen in the local hospitals (she lived in DC). After a time, all letters from George ceased, and after a few months of agonizing hope and despair, the Seibold family learned that George had died in combat. In her grief, Grace continued to volunteer at the hospitals, but she also began reaching out to other mothers who had lost children in the war. Years later, on June 4, 1928, Gold Star Mothers was officially established with the goals of comforting each other and comforting the many injured servicemen in the hospitals, so far away from their own mothers. Now, Gold Star Mothers is open to any mother whose child has died while serving in the United States Armed Forces. Gold Star Mothers Day is celebrated every year on the last Sunday in September. This entry was posted in Uncategorized and tagged Gold Star Mothers Day, september 2013. Bookmark the permalink. If it is celebrated on the last Sunday in December, why do you have it posted today?? Ackk! I am so glad you said that! 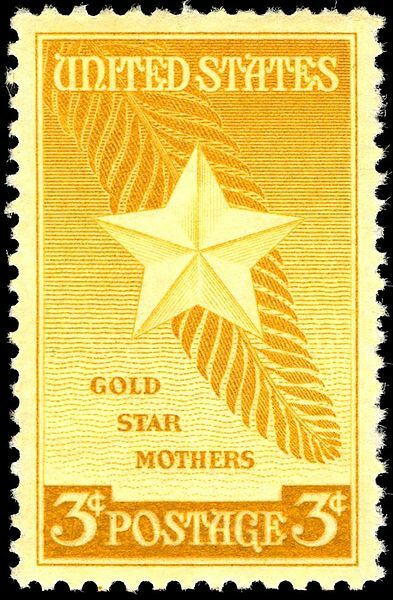 Gold Star Mothers Day is celebrated on the last Sunday in SEPTEMBER, not December. I just fixed it in the post. Yikes. Thanks for catching that for me.